BEIJING: The launch of INS Vikrant has raised hackles in China, with Chinese defence experts saying the aircraft carrier would have great significance for India as it would allow the Indian Navy to wade into the Pacific Ocean - which Beijing considers as its backyard. 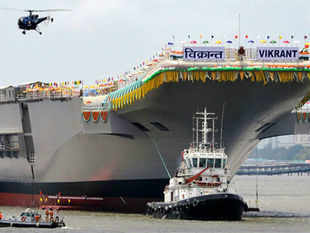 "This bears great significance to Indian Navy. It makes India only the fifth country after the US, Russia, Britain and France to have such capabilities," Senior Captain Zhang Junshe, Vice-President of China's Naval Research Institute, told the state-run CCTV today. The Indian Navy will have lead over China as it will have two aircraft carriers by the end of this year with INS Vikramaditya, the refitted carrier from Russia joining INS Viraat, which is already in service even though Vikrant was expected to be operational by 2018, he said. "Which means by the end of this year India will become the only country in Asia to have two aircraft carriers. This will enhance the overall capabilities especially the power projection capabilities of the Indian Navy," Zhang said. Ruling out any race for more carriers in the region, Zhang defended India and China having more carriers since they have vast coasts and huge populations and the importance of defending the sea lanes far from home due to dependence on external trade. Last year China has launched its first aircraft carrier, Lioning. Its hull was imported from Ukraine and refurbished in China. China also subsequently launched J-15 aircraft to operate from its deck. The ship with over 50,000 tonnes displacement will have about 30 aircraft on its deck. China is reportedly building two more aircraft carriers but their schedules are not known yet. Zhang earlier told the state-run China Daily that with Vikrant, the Indian navy will be more capable of patrolling distant oceans. "India's first self-made carrier, along with reinforced naval strength, will further disrupt the military balance in South Asia," he said. India is very likely to quicken its pace to steer eastward to the Pacific, where the US and China are competing to dominate. The launch of the Vikrant as well the first nuclear submarine Arihant also aroused the curiosity and concerns among analysts from different state-run think tanks in China. "The new indigenous carrier will further strengthen India's naval power and also add some bargaining chips with the world's major military vendors such as Russia," Wang Daguang, a researcher of military equipment based in Beijing told the Daily. Song Xiaojun, a military commentator in Beijing, said the Vikrant uses technology from the 1980s and thus serves as an experiment for the Indian Navy to set technical standards for future vessels.